In the tower of the church you can see the original west doorway produced in the Decorated style. On the face of the tower are some very weather-worn coats of arms. The large central one is that of Sir Francis Popham. Further up on the tower are three Hungerford shields. The one in the middle, with the Order of the Garter surrounding it, belonged to Walter, Lord Hungerford. Above these shields is the modern clock face, which is considerably larger than it appears from the ground. In the 1970s it was intended that the replacement for the former glass face should be a single circle of perspex. Instead it was necessary to install two semicircles with a horizontal join that has become more noticeable with age. 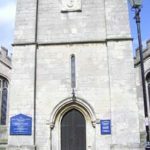 The south side of the church is typical 15th century Perpendicular in style – the embattled parapets with crocketed (ornamented on the inclined sides) pinnacles and the friezes adorned with carved figures of angels, animals and grotesques. The south doorway, which provides an emergency exit from the Baptistry, and the sun-dial above it to the left are also 15th century. The outside of the old Norman window can be seen in the north wall of the chancel and the old Decorated chancel east window in the east wall of the clergy vestry is still visible. The churchyard has some 19th century tombs. Burials before this time tended to be beneath the church itself or were, at least, commemorated within the church. 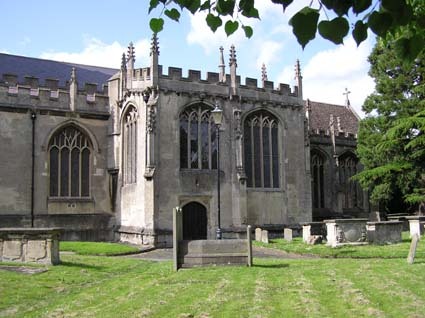 It was the mediaeval custom for people to be buried beneath churches. The more important the family, the nearer to the altar its members were placed. On the far side of the path is what is known as the “Old Churchyard”. Its gravestones now form the central path and it has been maintained since 1966 by the District Council as a garden. In spite of its name, this churchyard is actually later than the one round the church. It was originally the orchard of the vicarage. That vicarage is now St. Mary House. 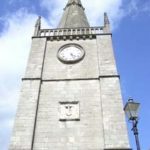 The initials GL on it refer to Gilbert Lake who was the vicar responsible for the 18th century restoration and extension of the building. In 1826, St. Mary House was exchanged for the Old Vicarage on the opposite side of St. Mary Street beyond the east end of the church. 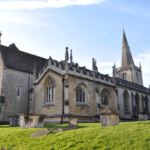 As the churchyard was becoming full at that time, Mr. E. F. Maitland, the new owner and one of Chippenham’s Members of Parliament, sold the orchard to the vicar and churchwardens and it was consecrated as a churchyard on 30th September 1826. The present vicarage, still in St. Mary Street, was built in 1966.